On Saturday 15th October 2016, the World Harmony Society will be holding a Children's Festival. The aim of this festival is to remind everyone what could affect the lives of our children now and into the future. The Society also aims to improve children's welfare, well-being and development of all children from all walks of life. The day will be an occasion to celebrate multiculturalism while working at understanding intercultural values and solidarity across diverse communities. The World Harmony Society is a non-profit organisation and holds many events throughout each year. 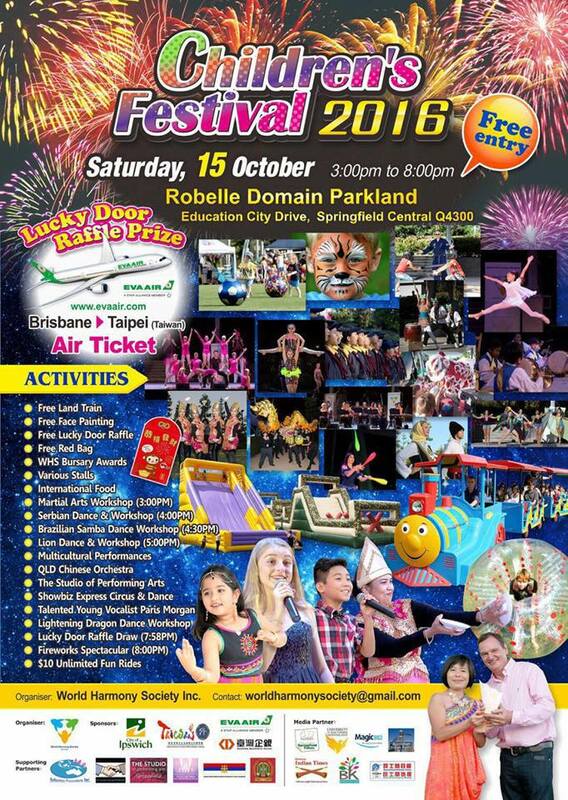 This event will be held at Robelle Domain Parkland at Springfield Central and the lucky door prize will be air tickets from Brisbane to Taipei; an excellent prize for free entry. The Robelle Domain Parkland covers a huge area of land at Springfield, providing lots of activities for children and adults to enjoy including waterfalls, a lagoon, water play areas, an interactive playground, picnic areas, land art pyramids, art work, exhibition gardens, treetop walks and a cafe. 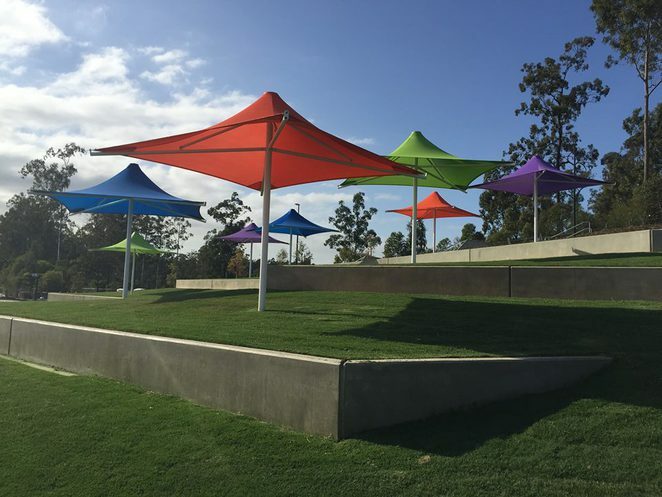 It's a great place for family events and community gatherings. Getting there from Brisbane you would take the Logan exit from the Gateway Motorway and then take the Centenary Highway/Northern Suburbs/Springfield exit. From the Gold Coast you would take the M1 towards Brisbane and then exit onto the Logan Motorways. If you wish to hold a stall on the day you can contact the Society to register. Cost is from $50 for a non-profit stall, to $70 for a craft stall and $230 for a business stall. Stall owners are required to bring their own tent, sandbags, chairs and tables, generator, power and light; however there is a 'no pegs allowed' policy on the day. Apart from the stalls, the festival will have free land train rides, free face painting and free lucky door raffle. There will be food from all nations and a fireworks display at 8.00pm. Workshops will be presented from different cultures and these include Martial Arts at 3.00pm, Serbian Dance & Workshop at 4.00pm, Brazilian Samba Dance Workshop at 4.30pm and the Lion Dance & Workshop at 4.00pm. A lot of times when you attend events, workshops times overlap with others; however the World Harmony Society have paced out these workshops so that if you are energetic enough, you can attend all four. 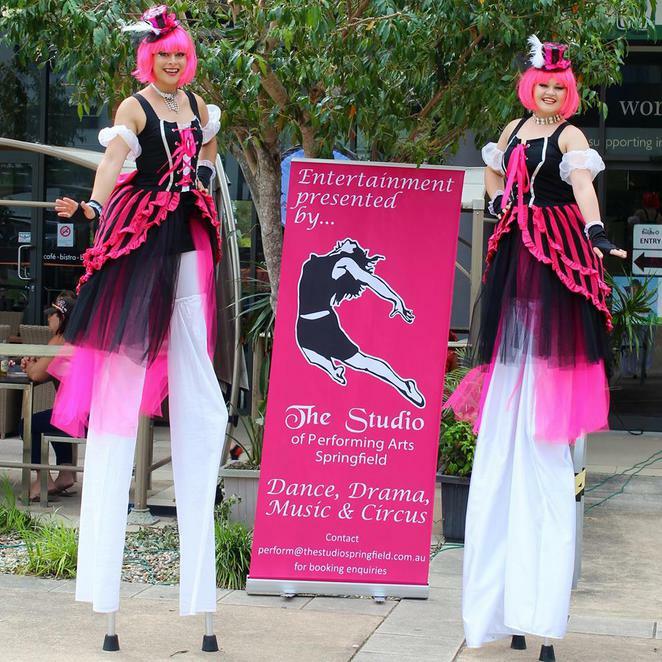 However, if you prefer to sit back and enjoy the whole event, there will be multicultural performances along with Showbiz Express Circus & Dance, The Qld Chinese Orchestra, young vocalist Paris Morgan and the Studio of Performing Arts. Don't forget to bring a blanket and/or chairs. $10 will purchase unlimited fun rides for the children, which will certainly keep them amused for hours. The Children's Festival will kick off at 3.00pm and continue until 8.00pm when the fireworks will end the night on a big bang. This will be another great event to put in your calendar for October with loads of activity to look forward to.